Facebook has come up with unique idea of separating Messanger from the app and a new app to be installed to chat with friends on the messanger app. 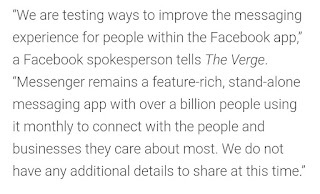 Coming to the latest developments, Facebook is planning to bring back Messanger into main app. Renowned reverse engineer Jane Manchun Wong spotted a new’Chats’ section integrated with the Facebook app. The section listed messages from previous conversations and opened from the same button that currently takes us to the standalone Messenger app. Now, this kind of integration is exactly how Facebook messaging used to work before the entry of Messenger in 2014. The Chats section, as Wong described, listed her previous Facebook messages but only with basic functionalities of seeing and replying to messages. There were no popular ‘Messenger-specific’ capabilities, like the option to send message reactions, share photo/video, or to make a call. Why Facebook is taking this U-turn? The integration, which still appears to be in the early testing stage, would allow users to message their Facebook friends without installing Messenger.